RAM is one of important part of Computers and Laptops.In these days,Everyone likes to play high quality games on their Computers but playing games on Computer that has less memory is almost impossible because games are required largeamount of memory for playing smoothly.So today I am sharing an article with you to How to Use USB Pendrive or Hard Drive as RAM in Computers and laptops.You can use yourPendrive as RAM by using ReadyBoost.ReadyBoost is feature inWindows 7,8,8.1 that allow us to use any Usb Pendrive or flash drive as instant RAM.So if you has a Pen drive and want to use it as Computer RAM then follow the steps given below. The full name of RAM is a Random-Access-Memory and speed of processing tasks is depend upon amount ofRAM.If the Computer have high Ram then computer process the tasks very fast and if the computer has low ram then task processing speed is slow.So speed of computer and processing task is depend upon theamount of Ram. 1. Insert the Pendrive in your Computer or Laptop and make you sure that Pendrive has at least 1 GB of free space. 2. Now backup your data and format the Pendrive. 3. 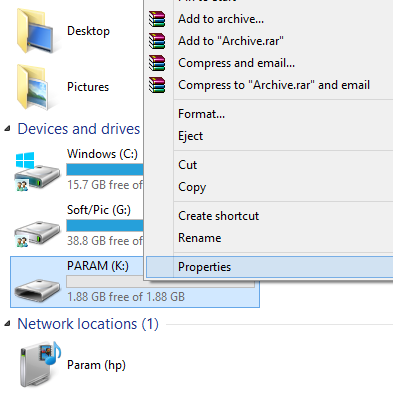 Now right-click on Pen Drive and click on Properties. 4. Click on ReadyBoost tab. 5. Now click on Use This Device. 6. Choose maximum space to reserve to system speed and click OK button. 1. Insert the Pendrive and delete all your data from it.Note that your should be at least 2 GB in size. 2. Now right-click on My Computer and then click on Properties. 4. Now click on Settings under Performance. 5. Click Advanced tab and then click on Change button under Virtual memory. 6. Select your Pen Drive. 7. Click on Custom Size. 8. Now enter the Initial and Maximum Size of Pen drive and click on Set button. 9. Now click on OK button and restart your Computer or Laptop. Now you can increase your Computer or Laptop speed by using your USB Pendrive as RAM.But this is temporary RAM so if you want RAM permanently then you should buy Ram from market.